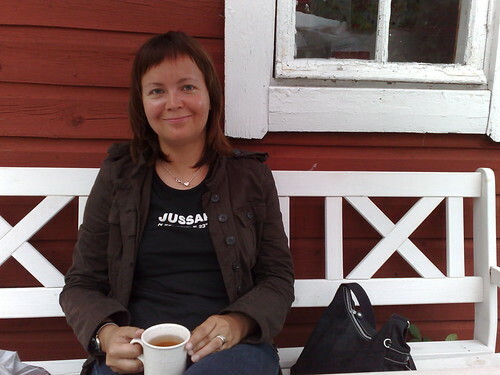 We’re having coffee in Cafe Gamla Stan in the wooden ‘old town’ part of Tammisaari. Again a pretty cafe in the garden of an old wooden house. The wind today was moderate and Kittiwake went very well. The weather was mostly fine – just some light drizzle as we motored in to the harbour at the end. Next we’re off to have dinner at the ‘Knipan’ restaurant. And then to a cultural festival with an interesting-sounding performance at 11pm. The festival is just across the harbour from the guest harbour and continues with DJ dance music after midnight – let’s hope we can get some sleep! Last night the winds got stronger and stronger, and the yachts in the harbour tossed and squirmed, jerking at their mooring ropes and slamming into their neighbours’ fenders. As the wind whistled and howled in their rigging, it drove the heavy rain almost sideways. In Kittiwake, I was kept awake most of the night, listening to every wave slap, fender squeak and rope scrape, feeling each toss and jerk, worrying if each was a sign of the boat loosening its mooring ropes and hitting the jetty. It was exhausting. Morning dawned with continuing strong winds and rain, and it was clear that we’d be fools to set out to sea in those conditions. Though the unreliable weather forecasts promised that the weather would improve in the afternoon, if we left so late our destination harbour at Tammisaari would surely be full. So we resigned ourselves to another day at Hanko. Now it’s late afternoon and the weather has indeed improved. Let’s see what tomorrow brings. This morning the weather forecast warned of possible strong winds, and we decided to be cautious and stay in the safety of Hanko harbour. Just as well, as a serious storm brewed up, and at times it was so windy it was difficult to walk straight on the harbour walls (this was before the beer drinking :-). The western approach to Hanko is very pretty, weaving through a scatter of tiny islands guided by these red and green lateral marks (and the map in the GPS, of course). But just after this photo was taken the wind dropped almost to nothing, and now we’re motoring the last part, the whole boat vibrating with the rhythmic throb of the little outboard engine. This morning we left Vänö early, and as we set out for Hanko Eve suggested a side trip to Högsåra to visit Farmors Cafe again, as we did with Anna and Raiku before. 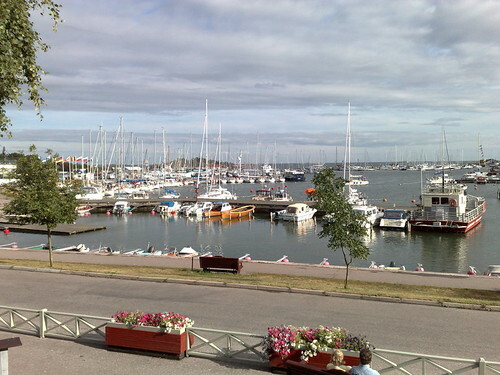 This time we went to Högsåra village guest harbour, which was closer than the Kejsarhamnen harbour we stayed in before. 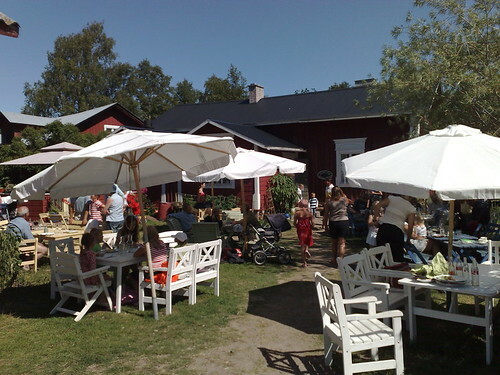 Farmors Cafe was just as pretty, and the Archipelago-style buffet was very good. And then back to the boat, and on to Hanko. 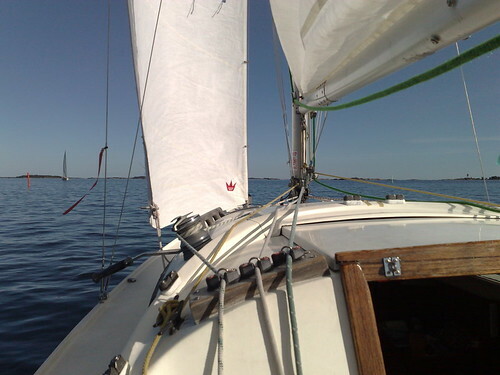 From Björkö we did the long sail to Vänö, which went very smoothly – just reaching along at 5-6 knots, turning the page of the chart book as we zoomed eastward. But Vänö was a big disappointment. We arrived just as the one shop closed, and moored to the jetty with a stern buoy that was far too close to the jetty for comfort, even for a little H-boat. The toilets were poorly maintained, and the whole place had a feeling of not being cared for. To cap it all, as darkness came swarms of mosquitoes descended, and we were reduced to taking refuge in our cabin. In the morning, we got up as quickly as possible and left. We didn’t feel too bad that, as the shop still hadn’t opened again, we didn’t get a chance to pay the harbour fee. From Jurmo we sailed on to Björkö (Birch Island), a high wooded island with a large freshwater lake. Björkö’s yacht harbour is just a sheltered inlet where you cast an anchor from the stern and tie the bow to rings in the rock. Very pretty and quiet, except that it was full of big Swedish yachts with lots of children. 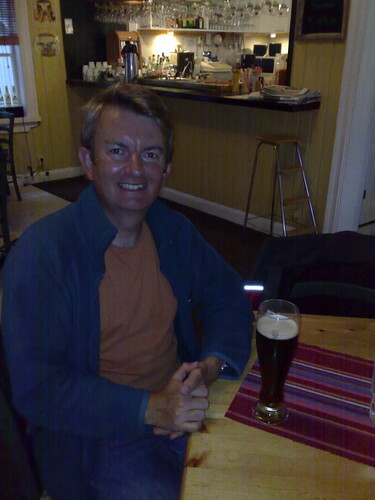 Yesterday we sailed from Utö to Jurmo, a trip of about two and a half hours. Jurmo is a very bleak island, again part of the Salpausselkä ice age moraine ridge. 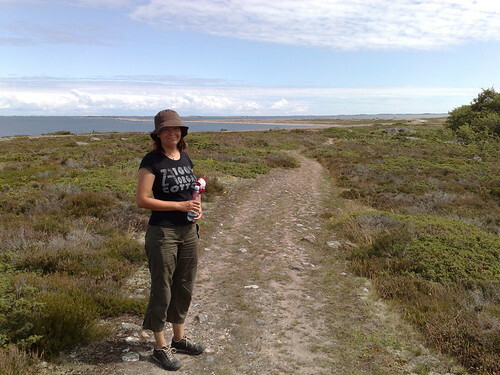 We went for a walk around it this morning, but the whole island was like walking on a rocky beach – very hard going. 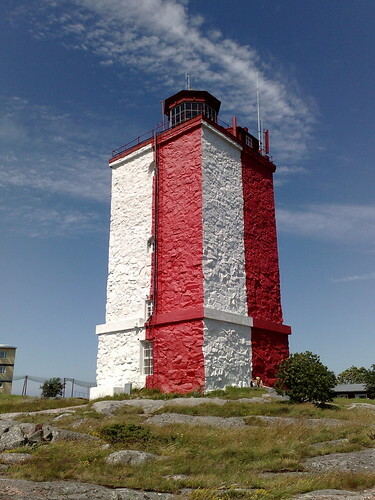 Here’s a nice photo of the lighthouse here at Utö. It’s not your usual graceful tapering cylinder, but still has a certain rugged charm. The weather forecasts were showing that the next couple of days would have near gale-force winds, and so wherever we went, we would be stuck there for a couple of days. 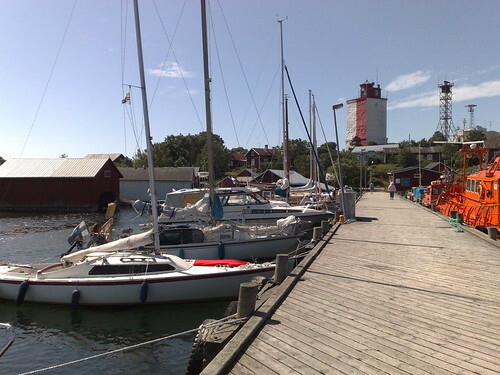 We checked all the nearby harbours, and plumped for Utö, as it had a shop, a café and an interesting-looking lighthouse. 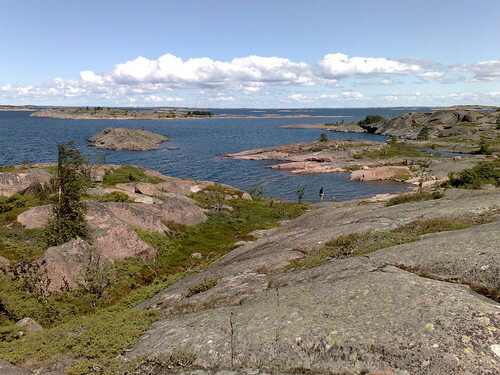 Utö , which means ‘out island’, is the southernmost inhabited island in Finland, and known for its dangerous waters. The trip from Gullkrona took eight and a half hours, but almost all on the same tack so Eve was able to get a nap on the way. The strong winds held off and the sailing conditions were ideal – we were doing about 5 knots most of the way. At Utö we decided to rent a room in an old wooden cottage here rather than sleep in the boat in the harbour. It’s nice to be back in real beds, and to have a bathroom with a hot shower. In a couple of hours we’ll have a guided tour of the lighthouse, and then later in the evening there’s a small handicraft gallery that has an ‘open evening’ with coffee and cinnamon buns. Copyright © 2007 Journal. Powered by WordPress and A Dream to Host theme by Art of Blog.